Our coming survey expedition is based upon mainly a unique Danish source of information giving the location, culture etc. of a former Atlantic island and how and when it was destructed. This source points out latitudes and longitudes for a limited area within which the former coastline of the island can be found. See map in menu option Spiritual Source. Besides this we know of the location of the main town, its buildings, houses and temples. We have precise drawings of its huge main temple still unknown to the public. See menu option Atze´s Account, Atze´s Temple. Our main historical source is Plato´s accounts on Atlantis. Our scientific sources consist of different fields of science. Besides we include legends of flods and deluges, language, human types and point out common culture between Central America and the Mediterranean for instance pyramids. We have worked on this project for many years using all possible spare time. We are all three Danish citizens. Martin Laungaard, 53, educated electrician and experienced filmmaker having produced and directed films and documentaries. Frank Laungaard, 67, a database advisor and programmer. He is educated teacher in mathematics/physics and chemistry/biology. Frank has worked with film previously. Carsten Skaarup, 68, teacher, bachelor in the science of religion, author, done documentaries, educated at Danish Documentary Film School. Jesper Nissen, 47, IT manager and Ceo. Holds a master of theoretical physics at Copenhagen University. Bo Krogh, Senior Surveyor, Director. at GEUS (Geological Survey for Greenland and Denmark). Leo K. Johannsen, 3D animator. Freddy Christensen, managing director F.C. Rov. Kristian, surveyer and rov expert. All based in/near Copenhagen, Denmark. Ronnie Glud, professor, geo marine biologist. Fatima Abrantes, geologist at INETI, Portugal. “This ash must have originated in enormous volcanic eruptions of the volcanoes in the West Indies or, more likely, on the central ridge of the Atlantic …” (Pettersson 1944). “A weak pointer in this direction was a single link of a thin copper chain dredged up with the mud at a Monaco station southwest of Santa Maria” (an island in the Azores group). (Pettersson 1944). Evidence of a former landmass in the Atlantic is to be found in Professor Hans Pettersson: “The Ocean Floor”, 1954. Pettersson is director at Oceanografiska Institutet, Göteborg, Sweden. long, the uppermost parts of which consisted of fairly homogeneous, fine-grained, deep-sea clay. In the lower part several layers of sand were found which mineralogical examination showed to be not mafic but of continental origin, that is, derived from a coastal shelf of some continent or large island. (Pettersson, 1954, p.95-96). “Most surprising of all, in the lowest stratum of this sand were found vegetable remains twigs, nuts, and bark fragments of dicotyledonous bushes or trees, bespeaking still more emphatically a continental or island origin. Finally, in the uppermost part of the same core Phleger and his co-workers (of Scripps Institution of Oceanography in La Jolla, (now in San Diego)) found a “displaced fauna” consisting of benthonic shallow-water foram shells which apparently had lived in depths of 100 to 200 meters.” (Pettersson, 1954, p. 96-97). been carried to the position of the find at lat. 7 29′ N., long. 45 I’ W.
… The mystery of the deep-sea sand in this part of the equatorial Atlantic Ocean cannot be considered solved.” (Pettersson, 1954, p 97-98). Mellis discusses different possibilities regarding origin, transportation and sedimentation. He concludes that its origin is most likely products of erosion from the Mid-Atlantic Ridge when it was more or less above sea level and that it was formed as beach sand produced on a coast line, not in the deep ocean. If Mellis is right the coast must have sunk and turned into deep ocean. “It is, of course, extremely radical speculation to identify these level stretches more than two miles below the sea surface as former beaches. Such a theory would require the obvious but almost incredible conclusion that the land has subsided two miles or else the sea has risen by that amount.” (Ewing 1948). According to Ewing, long flat stretches were detected 2 to 20 miles wide and hundreds of miles long. These beach-like areas were always covered with thick sediments, indicating a long period of deposition, although occasionally separated by mountainous “higher ground” exhibiting no such sediments. (The Central Highland of the Ridge occasionally approaches four-fifths of a mile from the sea surface.) Ewing observed that deep ocean basins never have thick sediments–which are the result of surf action and river deposition–it is actually shorelines that display thick sediments. More evidence of just how recently such a landmass existed turned up during an expedition the following year. “Sometime in the distant past this sand found deep beneath the ocean must have been located on a beach, at or near the surface of the sea” (Ewing, 1949). During this second Woods Hole Mid-Atlantic Ridge Expedition Dr. Ewing once again dredged up continental type rocks. Sample after sample containing large masses of sial were brought up all along the Mid-Atlantic Ridge. It became obvious that granite and sedimentary rocks “which originally must have been part of a continent” were abundant (Ewing, 1949). Dr. Rene Malaise states that many of the terrain features of the Mid-Atlantic Ridge, particularly the canyons, could not have been created by the underwater currents, but were formed when the land was above the sea level. (10). velocities on steep slopes appear to have been overestimated by Heezen and Ewing.” (Pettersson, 1954, p. 147, 150). Here Professor Pettersson says that the finding of beach sand in cores, if explained as caused by deep sea erosion (action of turbidity currents), is overestimated. Accordingly the main cause must be a former presence of land. Flat-topped Atlantis, Cruiser, and Great Meteor Seamounts. Source: Bruce C. Heezen, Maurice Ewing, D. B. Ericson, and C. R. Bentley at the Lamont Geological Observatory (Colombia University), Palisades, N. Y. “Another line of evidence helps to dispose completely of this explanation of seamounts. Foraminifera are minute protozoa that live in the sea. Their species vary from differences in the depth and temperature of the water in which they live, and those of past geological periods, found in fossil state, differ from living species. Professor Charles Hapgood also reported that a large unknown Atlantic Island appears on an ancient map (the famous Piri Rei map from 16. century). Athanasius Kirchers map from 1669. Seen from the north. In the upper corner: “Site of Atlantis, now beneath the sea, according to the belief of the Egyptians and the description of Plato.” The original map is said to have been taken from Egypt by the Romans, probably around 30 B.C. …Recent volcanic activity is not restricted to the central volcanic ridge but is widespread across the whole nodal basin area. …The extensive volcanism is suggestive of a magmatic production phase in the intersection area. Extremely fresh pillowed lava forms have been observed at the RTI inside-corner high, indicating possible off-axis volcanism.” 14 February 1990. Earth and Planetary Science Letter. It is based on a deep sea dive and written by a broad line of researchers: Vassilios Mamaloukas-Frangoulis, Jean-Marie Auzende, Daniel Bideau, Enrico Bonatti, Mathilde Cannat, José Honnorez, Yves Lagabrielle, Jacques Malavieille, Catherine Mével and H. David Needham. GDR “Genèse et Evolution des Domaines Océaniques”, 6 avenue Le Gorgeu, 29287 Brest Cedex, France Département “Géosciences Marines”, IFREMER Centre de Brest, BP 70, 29280 Plouzané, France Lamont-Doherty Geological Observatory, Columbia University, Palisades, NY 10964, USA Institut de Géologie, rue Blessig, 67084 Strasbourg Cedex, France URA Géodynamique, Sophia Antipolis, I avenue Albert Einstein, 06560 Valbonne, France USTL, Laboratoire de Tectonique, place Eugène Bataillon, 34060 Montpellier Cedex, France Université Pierre et Marie Curie, Laboratoire de Pétrologie, UA040736, 4 place Jussieu, 75252 Paris Cedex 05, France. The long traditional speculations and theories by individuals of all professions on the legendary Atlantis have also caught interest by some geologists. Recently Marc-André Gutscher at Center National de la Recherche Scientifique, Institut Universitaire Européen de la Mer in Plouzané, France has investigated this subject. He seeks to explain the legend of Atlantis narrated by Plato in terms of geological phenomena. Based on numerous geological similarities between Plato´s description of Atlantis and the paleoisland Spartel in the western Straits of Gibraltar, he asks if Spartel could be the lost Atlantis? His research is done by means of core samples, high-resolution bathymetric data, sea level data etc. ”Incidental, almost, to Keith’s efforts to buttress one of his points about a former emergent continent in the Atlantic ocean is the material that he summarizes on former shallow water or emergent sites sampled by the Deep Sea Drilling Project (DSDP). The sampling sites are currently underwater in the region of the Mid-Atlantic Ridge (MAR). Locations for three of these sites (Keith, M., 2001, table 1, “Evidence for a Plate Tectonics Debate,” Earth-Science Reviews, 55 pp. 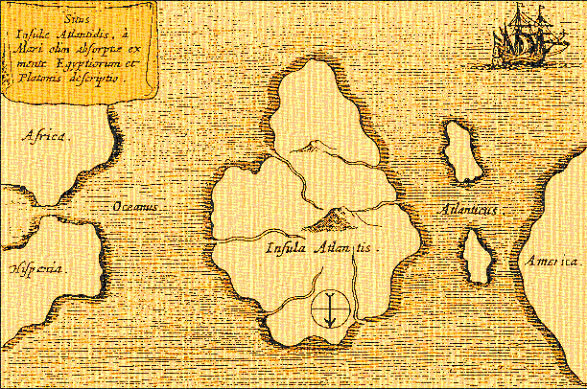 235-336) are shown by large red dots on figure 6, in a relief map of the Azores. The red dots are rather large because, while the sampling coordinates that are listed give degrees north latitude, they do not give degrees west longitude. It is understood, however, that the samples were taken in the vicinity of the MAR axial valley, clearly visible on Figure 6.
at site B, at a depth of 12,440 ft, basaltic pebbles and weathered and oxidized basalt were found. In 1957 Dr. Kolbe was commissioned with the investigation of the diatoms contained in the seabed cores obtained by the Albatross Expedition 9 years earlier. Dr. Kolbe is research associate at the paleobotanical department of the Swedish Museum of Natural History and lecturer in diatomology at the University of Stockholm. Diatoms are autotrophic plants and the main component of marine plankton. The life-circle of the diatoms is restricted to the upper strata of the ocean as their nutrition is dependent on the light. “My own investigations of the numerous cores collected by the Swedish Deep-Sea Expedition in the equatorial belt of the Pacific and Indian oceans did not reveal a single specimen of fresh-water species, except in the close vicinity of continents or large islands. The novelty of the present observations lies in the constant occurrence of fresh-water diatoms in Atlantic deep-sea cores, the large number of individuals, and the relatively great variety of species. More than 60 fresh-water species, belonging to various ecological groups, were observed: Plankton and benthonic forms, species typical for habitats rich in nutrients and even for some poor in nutrients, most forms being common cosmopolites – that is, species of world wide distribution.” (Kolbe 1957, p.1053). The regular and rather frequent occurrence of silicified epidermal cells belonging to terrestrial plants (Cyperaceae and Graminear) in many cores … They are to be found in fresh-water sediments and sometimes in near-shore marine deposits but, to my knowledge, are not known in deep-sea sediments. In Atlantic cores they occurred together with Melosira granulate and were almost as common as this form.” Science, vol. 126, p. 1054. (Kolbe 1957, p. 1054). The diatoms lived at their place of deposition and had their origin in lakes or other fresh-water habitats located in a part or parts of a former continent. According to Malaise´s hypothesis this continent was Atlantis. (Kolbe 1957, p. 1055). 12 Core samples from a specific area in the Atlantic Ocean. Survey Group has studied hundreds of cores from a vast area of the Atlantic Ocean. We have chosen 2 cores for further analysis with the hope of finding proofs of land such as diatoms and pollen. The Danish Geological Institute, GEUS analysed the 2 samples, and sent us the following text and diagram. We have now looked at the samples for diatoms and pollen. The samples were highly calcareous and high calcium carbonate content in sediments dissolves diatoms after deposition.This appears to be what’s happened with these samples as unfortunately there were no diatoms (although there would have been plenty in the water column) due to this. There is pollen in the samples, especially in the samples below 40 cm depth (in both cores) but not in great concentrations. I did a fairly quick estimate of concentrations (see table below). For comparison, marine cores off the Iberian Margin will give concentrations at least in the 1000’s and often in 10,000’s but some marine cores (eg Greenland fjords) also only give concentrations in the 1000’s. Pollen analysis at these latitudes show much higher concentrations during the last glacial period and this is also seen in marine cores off West Africa. It’s possible that the samples below 40 cm may be pre-Holocene (i.e. glacial) and the sample with low concentrations at 30-33 cm the only Holocene sample. Although there are some pollen types I don’t recognize as I haven’t analyzed samples from this region before, it is significant that there is no dominant pollen taxa. Isolated islands, such as the Azores, do not have large numbers of species and I would expect to see a dominance of one or two pollen taxa if there was land relatively close. All pollen types can be transported long distances, taxa such as Betula (birkes) and especially Pinus (Fyr) can be transported many thousands of kilometers. There is Betula in these samples but no Pinus which in itself is interesting but doesn’t help us much. In summary, it’s not impossible that there has been land in this area but these samples are not conclusive. Any further analysis should though, concentrate on samples above 40 cm as the sedimentation rate appears to be very low. I hope this helps and I’m sorry the results are not more definitive. * The cores showed no dominant taxa – (isolated islands as the Azores have limited number of species, so one would expect a dominance). * There was no pollen from pine but from betula – (pine is carried much longer by wind than betula). * There was charcoal. According to Catherine Ann charcoal was transported from Africa forest fires. We find that explanation unlikely because of 1) the distance and 2) charcoal was only in one sample. * The fact that there is betula in the Azores, but not in the core samples, is very interesting. (Could the betula pollen in Azores come from a sunken land mass?). Catherine Ann says the betula pollen could come from Africa (2-3000 km away). We do not agree, as pollen from betula sticks to moisture in the air long before it reaches far out across the ocean. This is also why we doubt charcoal can be transported from Africa. So far for the analysis regarding diatoms, pollen and spores. Let us have at look at the visual description of the cores, done by Lamont-Doherty Earth Observatory of Columbia University. Date redescribed: 11 November 1971 Redescribed by: C. Franck GENERAL: Foraminiferal marl (moderate orange pink) and foraminiferal chalk (pinkish gray); hard, dry and cracked. Carbonate content moderate to high. Coarse fraction consists primarily of planktonic foraminifera, with benthonic foraminifera, diatoms, ostracods, sponge spicules, echinoid spines, quartz, Radiolaria and plant debris. 0-40 cm: Foraminiferal marl, moderate orange pink (5 YR 8/4), hard, dry and cracked. Carbonate content moderate. Coarse fraction 20%, consisting primarily of planktonic foraminifera, with ostracods, diatoms, sponge spicules, quartz and benthonic foraminifera. Basal contact a sharp change in color and texture. 40-166 cm: Foraminiferal chalk, pinkish gray (5 YR 8/1), hard, dry and cracked. Carbonate content high. Coarse fraction 20%, consisting primarily of planktonic foraminifera, with diatoms, echinoid spines, benthonic foraminifera, sponge spicules, Radiolaria, quartz and plant debris. Commentary from the geologists on the question: What are clear indications of land in this sample? Benthic foraminifera and small animals that prefer shallow water; if you can find them in deep sea sediment, it indicates sunken land. Visual Core Description for VM17-163 (East of MAR)Date described: 27 July 1965 Described by: L. Burkle 0-140cm. : Lutite and foraminiferal lutite, moderate yellowish-brown (10YR5/4). Some burrow tracks present. Burrowing rather intense between 57-70 cm. Few manganese micronodules. Foraminifera present; foraminifera may amount to 30% of the sample in the top 5 cm. Carbonate content greater than 30%. The lutite fraction amounts to about 90% and the sand salt fraction about 10%. Bottom contact is sharp, marked by a color change. 140-152 cm. : Lutite, grayish-orange (10YR7/4) Burrow mottling present throughout. Few manganese micronodules present. Foraminifera present. Carbonate content amounts to greater than 30%. Lutite fraction amounts to 90% and sand-silt fraction about 10%. Bottom contact is sharp, marked by a color change. 152-163 cm. : Lutite and foraminiferal lutite similar to the 0-140 cm. layer. The bottom contact is moderately sharp, marked by a color change. 163-213 cm. : Lutite similar to the 140-152 cm. layer. Bottom contact is moderately sharp, marked by a color change. 213-221 cm. : Lutite, moderate yellowish-brown (10YR5/4) very well burrowed. Few manganese icronodules. Foraminifera present. Carbonate content greater than 30%. Lutite fraction amounts to about 90% and silt fraction about 10%. Bottom contact is sharp marked by a color change. 221-332 cm: Lutite and foraminiferal lutite very pale orange (10YR8/2) to grayish orange (10YR7/4). Burrow tracks present. These zones tend to alternate with zones in which there is little burrowing activity. Few manganese micronodules present. Foraminifera present. Carbonate content greater than 30%. Lutite fraction amounts to about 90% and silt fraction about 10%. Bottom contact is sharp marked by a change in sediment type. 332-341 cm. : Foraminiferal sand, grayish-orange (10YR7/4). Foraminifera make up about 80% of layer. Bottom contact is sharp and marked by a change in sediment type. 341-348 cm. : Lutite similar to the 213-221 cm. layer. Bottom contact is gradational and marked by a color change. 348-357 cm. : Lutite, similar to the 140-152 cm. layer. Bottom contact is gradational and marked by a color change. 357-369 cm. : Lutite, similar to the 221-332 cm. layer. Bottom contact is moderately sharp and marked by a color change. 369-380 cm. : Lutite, similar to the 213-221 cm. layer. Bottom contact is sharp and marked by a color change. 380-401 cm. : Lutite, similar to the 221-332 cm. layer. Bottom contact is moderately sharp and marked by a color change. 401-407 cm. : Lutite, similar to the 140-152 cm. layer. Bottom contact is moderately sharp and marked by a color change. 407-416 cm.- Lutite, similar to the 213-221 cm. lager. Bottom contact is gradational and marked by a color change. 416-428 cm.- Lutite, similar to the 140-152 cm. layer. Bottom contact is moderately sharp and marked by a color change. 428-443 cm.- Lutite, similar to the 213-221 cm. layer. Bottom contact is gradational and marked by a color change. 443-468 cm.- Lutite, similar to the 221-332 cm. layer. Trigger Weight Date described: 21 August 1966 Described by: W. Ruddiman 0-22 cm Foraminiferal lutite, moderate yellowish brwn (10YR5/4), homogenous and structureless. Sand fraction about 10%, of which 3/4 is foraminifera, 1/4 calcite fragments. Silt fraction about 10%, lutite about 80%. Carbonate content about 20%-25%. and recorded in the SDM-A ice core over the last 98 ka years. Preliminary data set generated for WAISCORES web site only. Note: The time scale is years counted from 1950. It is only presented here within the years 13.703 to 14.301 before 1950. The total maximum counting error in years for age 14.075 (before A.D. 2000) is 169 years, according to Rasmussen et al. : A new Greenland ice core chronology for the last glacial termination, “Journal of Geophysical Research,” vol. 111, pag.13, table 4, published 21. March 2006. According to the unique sources available to Survey Group Denmark the Atlantic landmass disappeared c 12.000 BC. i.e. c 14.008 years ago. Related to the timescale above: 14.008 years + (2008-1950) = 14.066 years. Approximately this year in the timescale a huge volcanic eruption happened. This cataclysm is confirmed by the sudden rise in SO 4 by 64,89 for the year 14063. Ashes from volcanic eruptions usually stay in the same hemisphere as the erupting volcano(es). Only if the volcanic activity is happening close to the equator or is unusually forceful the sulphuric acid (SO4) from it will show in the ice cores in both hemispheres i.e. in the cores from the Antarctic as well as those from Greenland. Such an extraordinary forceful volcanic activity must have happened in the years 14063 to 14073 (minus 50 years) as we see high values of SO4 in both time scales). Sulphuric acid from the same catastrophe is also seen in ice cores in the Northern hemisphere in Greenland, but in a bigger scale. (See the Greenland time scales below for the years 14.057 to 14.082). So according to the ice cores results the spreading of S04 happened in different ways for Antarctica compared to Greenland. In the Southern hemisphere the jet streams are weaker than in the Northern, so the passat winds carried the sulphur across the Aequator down to Antarctica. This happened in a more intense and direct way, and for a shorter period about 10 years as the time scales show. Regarding Greenland the passat winds transported sulphur for about 25 years in a constant and steady flow. This indicates that the location of the megavolcano(es) was in the Northern Hemisphere. The catastrophe must have been extraordinary forceful to be able to exceed the jet streams in the Northern hemisphere, provided the also existed about 14.000 years ago. Could this be the mega event that sank the former landmass we are talking about? Due to the amount of SO4 from the many volcanoes the climate on earth most likely became colder for a period, because the pollution of air and atmosphere lowered the warmth from the sun. Animal life and plant life was probably also influenced. If he temperatures continued to drop, this could have caused the latest ice age. Zielinski, G.A., and G.R. Mershon. 1997. Paleoenvironmental implications of the insoluble microparticle record in the GISP2 (Greenland) ice core during the rapidly changing climate of the Pleistocene-Holocene transition. Geological Society of America Bulletin 109:547-559. Zielinski, G.A., R.J. Fiacco, P.A. Mayewski, L.D. Meeker, S.I. Whitlow, M.S. Twickler, M.S. Germani, K. Endo, and M. Yasui. 1994. 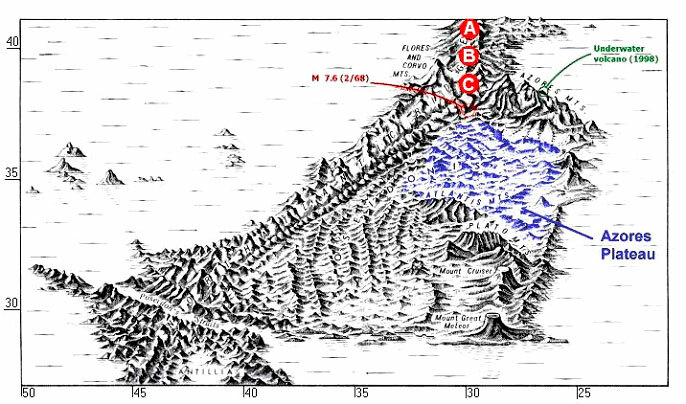 Climatic impact of the A.D. 1783 Asama (Japan) eruption was minimal: Evidence from the GISP2 ice core. Geophysical Research Letters 21:2365-2368. Hempel, L., and F. Thyssen. 1992. Deep radio echo soundings in the vicinity of GRIP and GISP2 drill sites, Greenland. Polarforschung 62:11-16. Palais, J.M., M.S. Germani, and G.A. Zielinski. 1992. Interhemispheric transport of volcanic ash from a 1259 A.D. volcanic eruption to the Greenland and Antarctic ice sheets. Geophysical Research Letters 19:801-804. Palais, J.M., K.C. Taylor, P.A. Mayewski, and P.M. Grootes. 1991. Volcanic ash from the 1362 A.D. Oraefajokull eruption (Iceland) in the Greenland ice sheet. Geophysical Research Letters 18:1241-1244. This file contains the volcanic sulfate record in the GISP2 core on the Meese/Sowers timescale. Each sample is approximately bi-annual for the last ~12,000 years with a consistent increase in the time covered by each sample to around 50 years/sample at 110,000 years ago. The volcanic sulfate record is derived by applying an empirical orthogonal function (EOF) analysis on the entire glaciochemical time series (Mayewski et al., 1997a). EOF 5 was found to explain 12% of the variance in the sulphate record, but it did not significantly explain the variance in any other chemical species. The excellent correlation in the EOF time series and the volcanic sulfate record for the last 9000 years, based on sulphate residuals over a robust spline (Zielinski et al.,1994a) indicates that EOF5 is an indicator of volcanic sulfate deposition over the last 110,000 years. Note: The time scale is years counted from 1950. It is only presented here within the years 13.701 to 14.301. According to the sources available to Survey Group Denmark the Atlantic landmass disappeared app. 12.000 BC. i.e. 14.008 years ago. Related to the time scale above: 14.008 years + (2008 -1950) = 14.066 years ago. Approximately this year in the timescale a huge volcanic eruption happened. This cataclysm is confirmed by the sudden rise in SO4 by 86/ 80/ 82/ 66/ 64 for respectively the years 14063/ 14069/ 14074/ 14078/ 14082. Ashes from volcanic eruptions usually stay in the same hemisphere as the erupting volcano. Only if the volcanic activity is happening close to the equator or is unusually forceful the sulphuric acid (SO4) from is will show in the ice cores in both hemispheres i.e. in the cores from the Antarctic as well as those from Greenland. Such an extraordinary forceful volcanic activity must have happened in the years 14063 to 14082 (high values of SO4 in both time scales). Sulphuric acid from the same catastrophe is also seen in ice cores in the Southern hemisphere in Antarctica, but in a smaller scale. (See the Antarctica time scales above for the years 14.063 to 14.073). So according to the ice cores results the spreading of S04 happened in different ways for Antarctica compared to Greenland. In the Southern hemisphere the passat winds carried the sulphur across the Aequator down to Antarctica in a more intense and direct way, and for a shorter period about 10 years as the time scales show. The catastrophe must have been extraordinary forceful to be able to exceed the jet streams in the Northern hemisphere, provided they also existed about 14.000 years ago. Due to the amount of SO4 from the many volcanoes the climate on earth most likely became colder for a period, because the pollution of air and atmosphere lowered the warmth from the sun. Animal life and plant life was probably also influenced. If the temperatures continued to drop, this could have caused the latest ice age. The classical philosopher and writer Plato (427 BC-347 BC)has described an oral account in detail about a big island in the Atlantic that disappeared in just one night. It was given to him through Solon (640 BC-599 BC) who heard it from Egyptian priests and passed it on orally to three persons till Plato heard it and wrote it down. The reason of this cataclysm was a decline and collapse of the culture in Atlantis, says Plato in his dialogue “Critias”. (20). According to Plato there is no doubt that a big number of individuals succeeded in fleeing in boats and reached the shores of both sides i.e. Africa and Central America. Common features in the cultures on both sides of the Atlantic Ocean indicate a common origin coming from the middle of the Atlantic. It seems to be a highly developed culture that disappeared way before the culture of Mesopotamia arose. Pyramids – Flood and deluge legends – Languages – Words – Human types – Animal and plant life. The pyramids are the most clear and weighty evidence of common features. Step pyramids are found nowhere else but in Egypt and in Mexico and South America except some minor ones in Iran called ziggurats. The pyramids in these two parts of the world are so alike that you cannot avoid thinking of a common origin, which could be a landmass in the ocean between. You can find legends of floods on both sides of the Atlantic, actually in great parts of the world. They appear in legends of various kinds and in tales of the creation of the world. The Epos of Gilgamesh is one of the oldest dating back to the 2nd millennium BC. It is a poem about the Babylonian hero Gilgamesh. In the New Testament (1 Mos. 6-8) there is a younger version that might be derived from Gilgamesh. In the East flood legends have been found by the peoples of Babylon and Chaldea in India, Media and Greece and by the Jews, the Sumerians and other places. In the West we find legends by the peoples of Mexico, Guatemala, Honduras, Peru and many Indian tribes of North America. The Mexican document on the creation of the world, Codex Vaticanus (named after the place it is kept i.e. the Vatican), tells us about the 4 ages of time before our time. The 4th age of time disappeared in a flood. The Mexican version of Noah (the one with the ark) is named Coxcox or Tezpi. Paintings of Coxcox have been found at the Aztecs, Miztecs, Zapotecs and other peoples, Donnelly says in his book “Atlantis – The Antediluvian World” 1882. He narrates that the Toltecs have their own flood legend described by the native Mexican historian Ixtilxochitl. In one of the few preserved old Mexican scriptures the head of the god Quetzalcoatl is pictured together with the flood legend. The Indian tribe Makushi in the northern part of Amazons talks of the legendary Makonem, the Prince from the Age of the Flood. In Greek legends are mentioned a deucalic flood only survived by Deucalion and his wife. When the first explorers reached Central America they wondered how Europeans with a Basque dialect could communicate with the native peoples. Accounts of how Europeans, the Basques, could entertain themselves with South American natives are found in history books from the 15th century. Braghines, a well studied Atlantologist, says “When in Guatemala, I often heard about one Indian tribe, living in the Peten district (northern Guatemala): this tribe speaks a language resembling Basque, and I have heard of an occasion when a Basque missionary preached in Peten in his own idiom with great success.” (21). F.W. Farrar says in Families of Speech: “The unique language of the Basques´ is not related to the rest of the European languages, but to the languages of the original inhabitants of the great opposite continent (America) and to their language alone.” (22). “As the only non-Indo-European language of Western Europe, Basque would appear to be the sole survivor of languages spoken there before the Indo-Europeans arrived.” (23)Words of the two completely separated races, the Mayans in Central America and the Hebrews in the Middle East, according to Marius Frandsen: “Atlantis – Realitet eller Utopi,” (24). Are these words and names accidental or do they originate from the same language? “With regard to the primitive dolichocephalae of America I entertain a hypothesis still more bold, namely, that they are nearly related to the Guanches in the Canary Islands … We find one and the same form of scull in the Canary Islands, in front of the African coast and in the Caribbean Islands, on the opposite coast, which faces Africa. The color of the skin on both sides of the Atlantic is represented in these populations as being of a reddish-brown.” (25). The Guanches lived in caves, they were not able to build ships and thus leave the Canary Islands. The professors Heer and Unger support of botanical reasons the theory that some time during the tertiary period, an Atlantic continent did exist, as this is the only reasonable explanation of the likeness between the Miocene (c 10-25 million years ago) flora of Central Europe and what today exists in the eastern America. “Es ist nicht zu läugnen, daß die tertiäre europäische Flora sowohl mit der nordamerikanische Flora überstimmt, als zugleich anklänge die Flora der Atlantischen Inseln zeigt, die ja auch ihren gegenwärtigen vegetabilischen Character nach ebenso zu Amerika als zu Europa hinneigen.“ (26). Plato´s dialogues on Atlantis are known as THE source. It is not difficult to recognize the word ”Atlantis” in the text above. The classical Greek writer Homer was right regarding the location of the old town of Troy, which was found by the amateur archaeologist Heinrich Schliemann in 1872. This has been confirmed today: The paleogeography of the ancient harbour of Troy was investigated using modern sedimentological techniques and was found to correspond closely to the Homeric accounts. (Kraft et al, 2003, Geology, 31, p. 163-166). Is Herodotus also speaking the truth here regarding an Atlantic landmass? “The Egyptians themselves were strangers who in very remote times settled on the banks of the Nile, bringing with themselves the civilization of their mother country, the art of writing and a polished language. They had come from the direction of the setting sun, and were the most ancient of men”. (28). Plato is the absolute historical authority of the former existence of an Atlantic landmass, which he called Atlantis. But before him was the Greek father of history, Herodotus, as seen above. In the Atlantic Ocean opposite the Pillars of Heracles, where Jupiter is situated today, was the mighty kingdom of Atlantis. Within Atlantis were ten kingdoms that were all under the supervision of Poseidon. The people of Atlantis behaved in an exemplary manner; they were not corrupt. All of Atlantis was like a pleasurable dream. The earth produced valuable trees. There were mines with precious metals. Because of the incredible climate there was a fertile agriculture. Houses and palaces pleased the people. There were roads and bridges and the economic freedom left room for many artists and philosophers. It was not hard for the Atlanteans to defend their realm against intruders envying them, and wanting to conquer mighty Atlantis. Thus they made themselves ready to defend their territory, their dignity weakened, and for the first time they felt like expanding their territory. The mighty army of Atlantis spread all over the known world and conquered nations and peoples. Agitated with their triumph they led vanity and pride rule and were attracted to corruption, a luxurious life and disrespect towards the gods. Zeus called the gods for a meeting to punish the degenerated people of Atlantis. As a consequence of this the earth shook violently and the sky went dark as if it was night. Forests were burned down and the ocean demanded soil and ate towns. The kingdom of Atlantis and its wealth disappeared for ever into the grandeur of the ocean. Nine of the highest mountains of this beautiful kingdom were not flooded. Later on minor islands and remains of this continent were populated. They are called the Azores and because of their mild climate and scenic beauty they remind us of Atlantis. Translated from the Portuguese into Danish by Danilo. From the Danish into English by Carsten Skaarup. – Frank, where do you think all of this is headed? I know exactly where it is headed …That discovery is going to be made. That’s where it’s headed, hopefully in our life time, but I would say definitely in the 21st century Atlantis will be found. I am really confident that is going to happen. – What happens to the academic world then? U.S. Geological Survey, 1936. Deep core soundings at Mid-Atlantic Ridge. Professor Hans Pettersson: “The Ocean Floor”, 1954. Deep sea deposits from the “Albatross” Swedish Deep Sea Expedition, 1948. Most surprising of all, in the lowest stratum of this sand were found vegetable remains twigs, nuts, and bark fragments of dicotyledonous bushes or trees, bespeaking still more emphatically a continental or island origin. Finally, in the uppermost part of the same core Phleger and his co-workers (of Scripps Institution of Oceanography in La Jolla, (now in San Diego)) found a “displaced fauna” consisting of benthonic shallow-water foram shells which apparently had lived in depths of 100 to 200 meters.” (Pettersson, 1954). “… One is at a loss to explain how these products of a coastal shelf and supramarine vegetation could have been carried to the position of the find at lat. 7 29′ N., long. 45 I’ W.” (Pettersson, 1954). …“Such a theory would require the obvious but almost incredible conclusion that the land has subsided two miles or else the sea has risen by that amount.” (Ewing, 1948). It became obvious that granite and sedimentary rocks “which originally must have been part of a continent” were abundant (Ewing, 1949). Geologist Marc-André Gutscher: Could the island Spartel be the lost Atlantis described by Plato? “One of the most interesting observations was the unexpected presence of many fresh-water diatoms in certain cores taken by the Albatross parallel to the coastline of Equatorial West Africa at a great distance off the coast.” (c. 900 km). Dr. Malaise theorized that parts of the Ridge must have existed as large islands up to the end of the last Ice Age or later. He also theorized that these landmasses must have had fresh-water lakes in order to account for the existence of fresh-water animals. The species were all recent species, indicating that the fresh-water lake was in existence within the last 10.000 to 15.000 years. Malaise, 1956 (15). “A remarkably find by Kolbe in two cores from the equatorial Atlantic is the occurrence of typical fresh-water diatoms in considerable numbers. Since this find was made in localities several hundred miles from the coast of northwest Africa, the origin of these fresh-water diatoms is puzzling.” Pettersson, 1954 (17). Prof. N. Zhirov, a Russian chemist, reported in 1970 sand beaches and coral at depths of 2 miles south of the Azores. Confirmed evidence exists that sections of the Mid-Atlantic ridge have been above sea level in the past and [fresh-] water diatoms have been found 2 miles down in the Azores area dated 10,000 to 12,000 BC. Zhirov 1970, (19). According to the unique sources available to Survey Group Denmark the Atlantic landmass disappeared c. 12.000 BC. Related to the timescale belowe a huge volcanic eruption happened approximately at this time. This cataclysm is confirmed by the sudden rise in SO4 by 64,89 and 40,98 for the years 14063 and 14073. The time scale is years counted from 1950. Related to the timescale above a huge volcanic eruption happened approximately at this time. Ashes from volcanic eruptions usually stay in the same hemisphere as the erupting volcano. Only if the volcanic activity is happening close to the equator or is unusually forceful the sulphuric acid (SO4) from it will show in the ice cores in both hemispheres i.e. in the cores from the Antarctic as well as those from Greenland. Such an extraordinary forceful volcanic activity must have happened in the years 14063 to 14073 (high values of SO4 in both time scales). Common features in the cultures on both sides of the Atlantic Ocean indicate a common origin coming from the middle of the Atlantic. Animal life and plant life. Herodotus: ”History”, book I, 202, Clio. R Cedric Leonard stresses: “The point here, which cannot be gainsaid, is that Atlantis was known before Plato–so well-known that the sea outside Gibraltar was commonly called the Atlantis Sea in Herodotus’ time. It had acquired that name because Atlantis had once occupied that area.” (27). Everyone enjoyed the richness of their kingdom, not forgetting the act of war. It was not hard for the atlanteans to defend their realm against intruders envying them, and wanting to conquer mighty Atlantis. Thus they made themselves ready to defend their territory, their dignity awoke, and for the first time they felt like expanding their territory. The mighty army of Atlantis spread all over the known world and conquered nations and peoples. Agitated with their triumph they led vanity and pride rule and were attracted to corruption, a luxurious life and disrespect towards the gods. Zeus called the gods for a meeting to punish the degenerated people of Atlantis. As a consequence of this the earth shook violently and the sky went dark as if it was night. Forests were burned down and the ocean demanded soil and swallowed towns. Translated from the Portuguese into Danish by Danilo; from the Danish into English by Carsten Skaarup. Fresh water diatoms have been found 2 miles down in the Azores area dated 10,000 to 12,000 BC. Zhirov 1970, (19). Most obvious common features: Pyramids – flood and deluge legends – languages – words – human types – animal and plant life. (1) Piggot, Charles S., “Core samples of the ocean bottom,” Smithsonian Report for 1936, No. 944, Smithsonian Institution, Washington DC, p. 207-16, 1937. (2) Pettersson, Hans, “Atlantis och Atlanten”, Albert Bonniers förlag, Stockholm, 1944. (3) Pettersson, Hans: “The Ocean Floor”, p. 95-97. Yale University Press, New haven, 1954. (4) Mellis, Otto: “Die Sedimentation in der Romanche-Tiefe (Ein Beitrag zur Erklärung der Entstehung des Tiefseesandes in Atlantischen Ozean)“, Geologische Rundschau“, 1958, p. 218-234. (5) Ewing, Maurice: “Exploring the Mid-Atlantic Ridge,” The National Geographic Magazine, Vol. xciv, No. 3, September 1948. (6) M. Ewing: “New discoveries on the Mid-Atlantic Ridge”, National Geographic Magazine, vol. xcvi, no 5, November 1949, p. 611-640. (7) Miller, J. P. & Scholten, R: “Ocean, Lakes, and Shoreline Features,” Laboratory Studies in Geology, No. 225, 1966. (8) Heezen, B.C., Tharp, M., Ewing, M: “The North Atlantic”, Washington D.C., 1959. (9) de Camp, L. Sprague: “Lost Continents,” Dover Publications Inc., New York, 1970. (10) Ocean Bottom Investigations and their Bearings on Geology. Geologiska Föreningen, Stockholm. March/April 1957. (11) Zhirov: “Atlantis,” Progress Publishers, Moscow, 1970. (12) B.C. Heezen, M. Ewing, D.B. Ericson & C.R. Bentley: “Flat-topped Atlantis, Cruiser, and Great Meteor Seamounts” (abstract), Geological Society of America Bulletin, vol. 65, 2, 1954, p. 1261. (13) Charles Hapgood: “Path of the Pole”, 1958, 1970, 1999, p. 241-242. Adventures Unlimited Press, USA. “Surveying the flanks of the Mid-Atlantic Ridge: The Atlantis Basin, North Atlantic Ocean (36ºN)”, Marine Geology 209, 2004, p. 206. (15) Marc-André Gutscher: “Destruction of Atlantis by a great earthquake and tsunami? A geological analysis of the Spartel Bank hypothesis.” Geology, vol. 33, issue 8, 2005, p. 685-688. (16) R.W. Kolbe: “Fresh water diatoms from Atlantic deep-sea sediments”, Science, vol. 126, 1957, p. 1053. (17) Malaise, Rene: ”Sjunket land i Atlanten”, Ymer, Stockholm, 1956. (18) R.W. Kolbe: “Turbidity currents and displaced fresh water diatoms”, Science, vol. 127, 1958, p. 1504-1505. (19) Pettersson, Hans: “The Ocean Floor”, p. 108, Yale University Press, New Haven 1954. (20) Plato: “Critias”, 360 BC. Benjamin Jowetts translation, Random House, N.Y. 1937. (21) Alexander Braghines: “The shadow of Atlantis”. 1940. (22) F.W. Farrar: “Families of Speech: Four Lectures Delivered Before the Royal Institution of Great Britain.” March 1869. Logmans, Green & co., 1870. Digitized Jan 29, 2007. 192 pages. (23) Kenneth Katzner: “The languages of the World,” 2002, p. 58-59. Routledge. (24) Marius Frandsen: “Atlantis – en realitet eller en utopi”,1969, p.31, Strubes, København, Denmark. (25) Professor Anders Retzius in Smithsonian Report, 1859 p. 266. (26) Professor Franz Unger: “Die versunkene Inseln Atlantis”, 1860, p. 18, W. Braumüller. Originally from the University of Michigan. Digitalized 29. March 2006. (27) R. Cedric Leonard: “Pre-Platonic Writings Pertinent to Atlantis.” www.atlantisquest.com. (28) Frank Joseph:”The Atlantis Encyclopaedia”, p. 127, 2005, Career Press, NJ 07417, USA, 2005. All the above mentioned scientific data from the different areas are collected to confirm the actuality of our unique material. The 16 pieces of text below form the basis of this unique material. The texts stem from a small group of Danish researchers in the beginning of the 20th century. Their work covers a vast range of subjects, whereas this subject is only a small fraction. It was published in 1920. It must be said though that the full perception of the culture of this landmass, its fall and destruction etc. cannot be understood separated from their work as a whole. Regarding the description of a sunken landmass, its location, culture and destruction, we shall leave it to the reader to evaluate the relevance of this material. For a better general view this text is divided into 16 parts. Most parts are given one or several numbers, referring to the same number in the scientific papers’ text. This is done to show their match. Earthquakes and volcanic activity ravaged the entire island for about ten months until the final catastrophe completely destroyed and obliterated the rich and cultured empire within a few hours. The final eruption created a flood, the effect of which reached far and wide. The memory of this flood is still retained in the ancient legends of many peoples. (20, p. 18: Flood and deluge legends). Polytheism predominated here also, but at that time without human sacrifice. However, animals were sacrificed throughout the island. The inhabitants were sun and fire worshippers. The people were generally at a high cultural level. The priests had quite an advanced knowledge of astronomy – several were astrologers or magi – and were able to distinguish between the planets and the fixed stars and to calculate approximately the eclipses of the sun and the moon; however, they attributed these phenomena to the intervention of an evil spirit. The art of printing made its first primitive appearance on this island, the priests having managed, by a form of hectography, to produce multiple copies of the written accounts. For this purpose an extract of crushed animal and fish bones was used, which after careful distillation was poured into flat earthenware moulds. Closely woven fabrics of plant fibres were used, since neither papyrus nor parchment was known at the time. Impressions were made with a printing ink consisting mainly of burnt bone mixed with some adhesive substance. Pictographic text was mostly used, though ideographs were used in some places. Basins, bowls and vases were often engraved with ornamental animals and leaves, whose outlines were filled in with brilliant colours. Gold, copper and to some extent silver were all known and used for jewelry and finer utensils, as well as for inlays in the carved wooden images of the gods. Many such images were hewn in stone or formed out of various metallic alloys. The art of building was especially highly developed. Lyrical poetry was coming into being, especially in the form of religious hymns that were intoned by the priests to the accompaniment of the beating of cymbal-like copper plates at the sacrificial rites. The cult of death was known over the entire island. The island was divided into three realms that had a common sovereign ruler. In one of the realms the succession to the rulership descended by both the male and the female lines. The supreme ruler was in addition the chief servant of the temple. On this island the eldest of the Youngest (a special religious person) was incarnated for the third time, as prince and high priest. He was greatly loved by the people for his humane and gentle rule, he made several religious and ethical laws, but his attempts to abolish polytheism did not succeed. His incarnation on this island left few traces upon the culture of the people, since he died in the same year that the island disappeared into the sea. His memory lived with those who escaped the destruction by fleeing and was preserved through many generations. He was regarded as a divine emissary. This part of the unique material, which is presented here, was produced in the years 1913-17 and published in 1920 in the Danish. At that time the Mid-Atlantic Ridge and plate tectonics were not yet discovered. Accordingly we have two different sources of information from a different time period on the same subject: The possibility of a former landmass in the Atlantic Ocean. The scientific papers include several citations by scientists wondering how evidence of land could be found in core samples way out in the Atlantic Ocean. Some of them even conclude that here must have been land. It seems clear that a closer investigation of the Atlantic Ocean bottom on basis of this report has a good chance of success, revealing artefacts from a former culture. Survey Group Denmark does possess relevant additional material for this purpose.